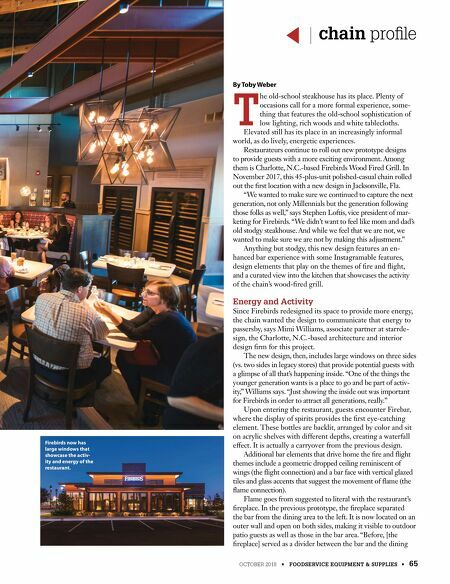 Deck Byline OCTOBER 2018 • FOODSERVICE EQUIPMENT & SUPPLIES • 65 chain profile By Toby Weber T he old-school steakhouse has its place. Plenty of occasions call for a more formal experience, some- thing that features the old-school sophistication of low lighting, rich woods and white tablecloths. Elevated still has its place in an increasingly informal world, as do lively, energetic experiences. Restaurateurs continue to roll out new prototype designs to provide guests with a more exciting environment. 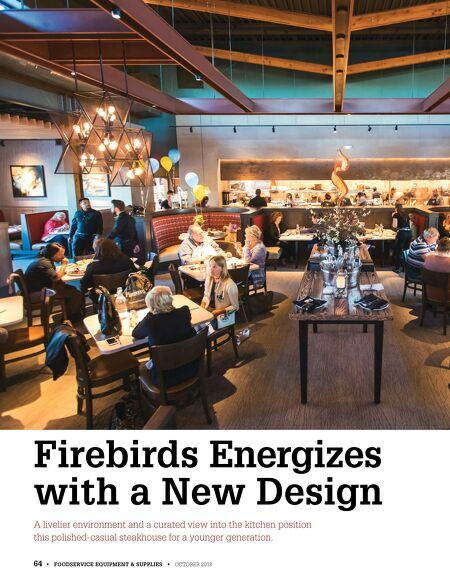 Among them is Charlotte, N.C.-based Firebirds Wood Fired Grill. In November 2017, this 45-plus - unit polished-casual chain rolled out the first location with a new design in Jacksonville, Fla. "We wanted to make sure we continued to capture the next generation, not only Millennials but the generation following those folks as well," says Stephen Loftis, vice president of mar- keting for Firebirds. "We didn't want to feel like mom and dad's old stodgy steakhouse. And while we feel that we are not, we wanted to make sure we are not by making this adjustment." Anything but stodgy, this new design features an en- hanced bar experience with some Instagramable features, design elements that play on the themes of fire and flight, and a curated view into the kitchen that showcases the activity of the chain's wood-fired grill. Energy and Activity Since Firebirds redesigned its space to provide more energy, the chain wanted the design to communicate that energy to passersby, says Mimi Williams, associate partner at starrde- sign, the Charlotte, N.C.-based architecture and interior design firm for this project. The new design, then, includes large windows on three sides (vs. two sides in legacy stores) that provide potential guests with a glimpse of all that's happening inside. "One of the things the younger generation wants is a place to go and be part of activ- ity," Williams says. "Just showing the inside out was important for Firebirds in order to attract all generations, really." Upon entering the restaurant, guests encounter Firebar, where the display of spirits provides the first eye-catching element. These bottles are backlit, arranged by color and sit on acrylic shelves with different depths, creating a waterfall effect. It is actually a carryover from the previous design. Additional bar elements that drive home the fire and flight themes include a geometric dropped ceiling reminiscent of wings (the flight connection) and a bar face with vertical glazed tiles and glass accents that suggest the movement of flame (the flame connection). Flame goes from suggested to literal with the restaurant's fireplace. In the previous prototype, the fireplace separated the bar from the dining area to the left. It is now located on an outer wall and open on both sides, making it visible to outdoor patio guests as well as those in the bar area. "Before, [the fireplace] served as a divider between the bar and the dining Firebirds now has large windows that showcase the activ- ity and energy of the restaurant.